Protecting Public Lands Update: It's on the November 2018 Ballot! "Dedicated to constant vigilance, judicious management and conservation of our precious natural resources." Mission Statement: "To promote the statutory responsibilities of Connecticut Conservation Commissions and Inland Wetland Commissions and to foster environmental quality through education and through the conservation and protection of wetlands and other natural resources." No opportunities at this time. Check back. 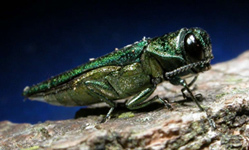 New Haven, CT – The Connecticut Agricultural Experiment Station (CAES) and the Department of Energy and Environmental Protection (DEEP) todayannounced that the emerald ash borer (Agrilus planipennis) was detected in Prospect, CT on July 16, 2012 by staff members at CAES. The identification has been confirmed by federal regulatory officials in the USDA Animal and Plant Health Inspection Service, Plant Protection and Quarantine (USDA APHIS-PPQ). This is the first record of this pest in Connecticut, which is added to 15 other states where infestations have been detected. A new probable site of infestation is located in the Naugatuck State Forest. The beetle identification is unconfirmed. The emerald ash borer is responsible for the death and decline of tens of millions of ash trees from the mid-west to New York State and south to Tennessee. Ash makes up about 4% to 15% of Connecticut's forests and is a common urban tree. Vine Mile-a-minute vine is a highly invasive annual plant from eastern Asia that can quickly cover, outcompete and replace native vegetation, damaging habitat for native plants and animals. Early detection and rapid response are essential for control. Mile-a-minute was first found in Connecticut in Fairfield County in 1997. Since then, it has spread to 20 Connecticut towns, as far east as Stonington and as far north as Simsbury. Mile-a-minute spreads by seed and quickly grows into dense stands. Seeds are spread by wind and water. Visit mam.uconn.edu/ for additional identification tips, photographs and control information. You can also contact Logan Senack (logan.senack@uconn.edu) or Donna Ellis (860-486-6448; donna.ellis@uconn.edu) for additional information. To report a suspected mile-a-minute invasion, visit the above website or contact Donna Ellis at UConn at 860-486-6448. If you plan to conduct stream temperature monitoring you must be check for quaility control measures. CACIWC is pleased to provide Conservation Commissions with a new environmental toolkit pamphlet to help commissioners properly assess development proposals that may come before their town. Click here to download pamphlet. Yellow groove running bamboo has naturalized by rhizomes washing downstream. Naturalized colony documented on 7-28-2013 in Pine Brook Preserve - Haddam, CT.